Established by the 'Hockley Brickwork Company' in the latter half of the 19th century the Hullbridge brickworks along with many others around this part of Essex supplied the demands of the booming east London housing and factory developments of the time. The riverside location was important as materials could be brought in and bricks taken out by barges. To house some of the workforce a row of ten terraced houses was built along Pooles Lane just behind the brickworks. There still known today as the 'Brickmakers Cottages'. A prominent riverside landmark for many years was the water tower, built to supply the brickworks site with water for the brick-making process. 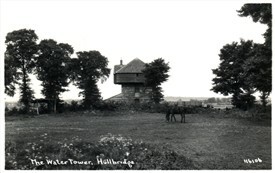 The tower remained intact for some time after the brickworks closed down. Its novel construction of a tank in a wooden house on top of a tall block work structure made it something of a tourist attraction. Unfortunately by the 1950's the now dilapidated wooden house had become unsafe and had to be removed along with its tank. The block work remained. Reduced in height and remodelled with a castellated top it became an interesting feature of the Tower Mobile Home Site which took its name from the tower. In the early days of the Tower site it was used to house the electricity generator until it was hit by a lightening strike during a storm. The equipment was badly damaged, consequently the site was put on the National Grid. The ownership of the Tower site passed to Mr Berkeley (Berkeleyparks) and he had the remains of the tower demolished to make way for more mobile homes. The first postcard by Fred Spalding c1905 shows the brickworks with the two kiln chimneys facing the river. The water tower is partly hidden by a tree at the top of the picture. 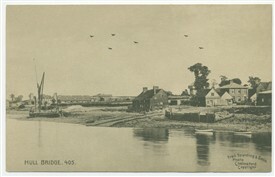 The second picture is by Bell c1929. The water tower viewed from Pooles Lane. Quite an impressive sight close up. The third picture by Alfred Padgett c1920's is a view of the 'Brickmakers Cottages' on Pooles Lane, shown more or less as they were built without the later porch additions. This page was added by David Whiffin on 23/11/2013. Alfred Hobman had an advert in the 1902 trade directory for red bricks, tiles and chimney pots using London clay and divided London clay. 12 wash-backs with capacity for 5,000,000 bricks. A horse driven pug mill. 2 drying sheds heated by underfloor steam pipes. Water was provided from an artesian well. Sufficient clay mixed with chalk, sand and ashes to make 1,200,000 stock bricks. Sufficient washed clay for 300,000 red facing bricks. The brickworks was described as disused by 1915. It was established in c1899 by Alfred Hobman on a 65 acre site with five kilns, a hand worked tramway and a timber jetty on the river. No’s. 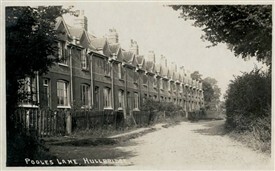 9 and 10 ‘Hobman's Cottages’ in Hullbridge were listed as unoccupied. ‘Foreman in Brickfields’: 40 year old Arthur Cheel of Rose Cottage. ‘Watchman in Brickfield’ 69 year old George Binder of Hullbridge. ‘Red Brick Maker’ 36 year old Arthur Salmon of 3 Riverside Cottages. ‘Brickmaker’ 35 year old Frederick George of Hullbridge. ‘Brickfield labourer’ 31 year old George Wilson of Hullbridge. ‘Labourer in Brickfield’ 19year old Percy Key of ‘the shop’ Hullbridge. ‘Labourer Brickfield’ 60 year old John Truss of Hulbridge. The works and equipment were sold by auction in 1904 to R.Y Ames and R.W. Hunter of Hockley (trading as Ames & Hunter). In 1912 the Tudor Brick & Tile Co. Ltd. was formed to take over the brickworks business with Ames and Hunter as directors. The company was dissolved on 15th December 1916. Here is the 1922 0/S map centred on the water tower. It also shows the then disused brickworks buildings. Neither the brickworks nor the brickworks cottages are on the 1897/98 O/S maps. If the date of the first postcard is correct the brickworks must have been established sometime between 1898 and c1905 and it had closed by 1922. I do have some more information about the brickworks company in Hullbridge and I will post this when I have found it.